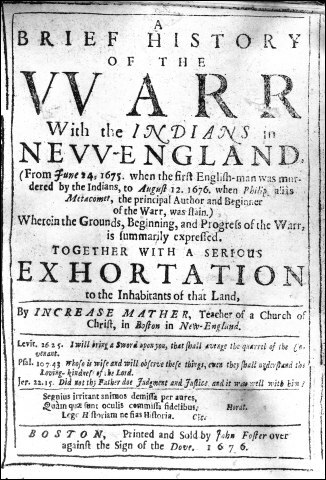 Title page, Increase Mather's A Brief History of the War with the Indians in New England, Boston, 1676. Increase Mather's history was one of the first of many colonial post-war texts that made sense of Metacomet's uprising through the Puritan view of history. The slaying of Metacomet [or Metacom] in August 1676 ended the Indian threat to the Massachusetts Bay Colony. Indian resistance to English colonization and expansion continued, however, well into the eighteenth century on the northern and western frontiers. In 1692, Increase Mather’s eldest son, Cotton Mather, would write, "Our Indian wars are not over yet." He went on to write his own history and interpretation of the continuing conflicts between Indians and Puritans and in the process helped define the mythology of the Puritan captivity narrative.